Synonyms: When a Gun Nerd Is Reincarnated to a World of Magic, He Established a Harem army with Modern Weapons!? Published: Jun 9, 2015 to ? Houta Youta, 27 years old, was a virgin, a high school dropout, and a former hikikomori. His life had been pretty horrible since his high school years and now, on his way home from work at the metalworking factory, he gets stabbed to death by a drug addict. However, it seems that he has been reborn in a fantasy world. Alternative version: Gun-Ota ga Mahou Sekai ni Tensei shitara, Gendai Heiki de Guntai Harem wo Tsukucchaimashita!? Gun-ota, aka. the Japanese still don't know how to make short titles so don't count on me to fully rewrite it here, is, in itself, a manga with a lot of potential, and is somewhat friendly user, so most people should enjoy it. (Note: the only reason I'm not putting a higher note is because the manga hasn't gotten very far yet, still gonna see how it unfolds) This story follows a young man named Lute, who is starting a nice career at a metal constructor, and everything is going well! He's made nice friends, his workplace is nice etc. that is until the poor kid gets stabbed multiple times in the chest (not too lucky huh?) by an unstable psycho who he had known when he was younger. He then revives, as a orphan, in a beautiful world with magic, demons, and half-human girls (hurray for animal ears!). There, he'll grow up with his childhood friend, snow, a white-haired fox girl (maybe he's lucky after all) and will live all kind of adventures! (don't look at me like that, I'm not here to narrate the whole goddam story). Truthfully, this is the weak point of this manga. Some may say each artist has his own style, but this is a too low quality for a professional manga, but, the story is so fun you'll quickly forget it, and it gets better each chapter anyways. The two MC's are actually very well done, while instead of having the usual tsundere as the FMC, you have snow, the new definition of overly-attached girlfriend, without being a psycho nonetheless (damn, you so lucky lute). Lute, on the other hand, has been done quite specially, the character, even as a baby or child, has kept his consciousness of an adult, from his previous life, he's, in that sense, way more mature and is asking some questions you'd never hear from a child, which is, in my opinion, a very interesting concept. Like I said earlier, this manga has a MASSIVE amount of potential, but the author has barely started so we'll have to see how it evolves. 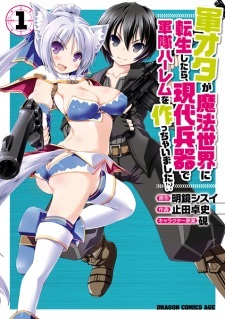 This kind of story can be compared to another rather known series, GATE, with very similar concepts (modern weapons in ancient world, action and a bit of romance, comedy, harem ( ͡° ͜ʖ ͡°), etc.) if you like this kind of story this manga is made for you, if not, well, you may keep scrolling.